The Ketogenic Diet for Health: Why are heart disease and dental health related? Why are heart disease and dental health related? Some years ago people became excited about the news that poor dental health, particularly gum disease, and heart disease are correlated. Not only that, but gum disease develops first! Post hoc ergo propter hoc ("after this, therefore because of this") right? Soon we started hearing advice to take good care of our teeth (by brushing and flossing), because it will help us avoid heart disease. Meanwhile, scientists started looking for mechanisms behind this putative ability of oral bacteria to effect your cardiovascular health. Not only has a causal relationship not been established, but, in my opinion it's highly unlikely, because there is a simpler explanation. Suppose we have two things that are correlated: they happen so often together that they look like they might have a causal relationship. The correlation is spurious. It's pure coincidence. They are not causally related at all, even though they happen together so often it looks like it isn't random. That's the thing about randomness. There is variability in it. A huge dataset is going to have some patterns in it, even though those patterns are no good for predicting future data . Something about the process of heart disease increases the risk of gum disease, or something about the process of gum disease increases the risk heart disease. A third thing causes both. There is something that elevates the risk of both gum disease and heart disease. Fermentable carbohydrates (those that break down in the mouth, i.e. sugars and starches) cause tooth decay, unhealthy dental plaque, and gum disease. Eating carbohydrates increases the risk of heart disease. Therefore the correlation between gum disease and and heart disease may be due to a common causal factor. It could well be that dental disease simply manifests faster, which would mean you can use it as a warning sign. Covering up the evidence with extensive oral hygiene routines wouldn't address the real problem. What are fermentable carbohydrates? They are certain sugars, including the simple sugars glucose and fructose, and the sugars that result from starches that begin digestion in the mouth through amylase, particularly maltose . Cavities form when bacteria in plaque ferment carbohydrates into acid, lowering the pH of dental plaque below a critical level that results in demineralisation of tooth enamel. The bacterial species that do this thrive best in the resulting acidic environment, which is hostile to other species. So fermentable carbohydrates both provide fuel for the bacteria, and when metabolised create a selective environment for them. , . Plaque itself accumulates to excess because of those same fermentable carbohydrates. Periodontal disease (gum disease) is an inflammatory response to bacterial products in dental plaque . We already know that a low carb diet has a better effect on heart disease risk factors than any other intervention. If you have metabolic syndrome, then a low carb diet is the best treatment. Therefore, conversely, eating a lot of carbohydrates increases your risk comparatively. Moreover, poor dental health is so correlated with diabetes (the canonical metabolic syndrome disease) that some authors have called periodontitis a complication of diabetes . The ability of scientists to uphold such a backwards concept is hard to comprehend. Here's a particularly ridiculous promotion of that idea from the American Dental Association. If I didn't find it such an irresponsible abuse of authority, I'd be laughing hysterically . What does dental disease signify and what should you do about it? It's my contention that dental disease is a risk factor for heart disease and diabetes and all other diseases secondary to metabolic syndrome, but not because dental disease is a cause of those; rather because it is a fast manifesting symptom of a detrimental diet. "Two contradictory hypotheses on the role of dietary carbohydrates in health and disease shape how dental-systemic associations are regarded. On one side, Cleave and Yudkin postulated that excessive dietary fermentable carbohydrate intake led—in the absence of dental interventions such as fluorides—first to dental diseases and then to systemic diseases. Under this hypothesis, dental and systemic diseases shared—as a common cause—a diet of excess fermentable carbohydrates. Dental diseases were regarded as an alarm bell for future systemic diseases, and restricting carbohydrate intake prevented both dental and systemic diseases. On the opposite side, Keys postulated the lipid hypothesis: that excessive dietary lipid intake caused systemic diseases. Keys advocated a diet high in fermentable carbohydrate for the benefit of general health, and dental diseases became regarded as local dietary side effects. Because general health takes precedence over dental health when it comes to dietary recommendations, dental diseases became viewed as local infections; interventions such as fluorides, sealants, oral hygiene, antimicrobials, and dental fillings became synonymous with maintaining dental health, and carbohydrates were no longer considered as a common cause for dental-systemic diseases. These opposing dietary hypotheses have increasingly been put to the test in clinical trials. The emerging trial results favor Cleave-Yudkin’s hypothesis and may affect preventive approaches for dental and systemic diseases." If you have dental plaque accumulation, tooth decay, or gum disease, don't brush it off. It's a warning to you that your diet is unhealthy. That's why you should never trust a study that takes all of its data and reports a correlation, without holding out some of the data (and not peeking!) and showing that the relationship found in the first set also holds in the second set. Think NHANES. Even then you have to trust the scientists that they didn't look at the second set before coming up with the hypothesis. Even then, you have to take into account that again by random chance the pattern held in the first set also holds in the second. Lingström P, van Houte J, Kashket S.
Crit Rev Oral Biol Med. 2000;11(3):366-80. "In general, it is only the gelatinized starches that are susceptible to enzymatic breakdown, i.e., are bioavailable. In the human mouth, starches can be hydrolyzed by salivary and bacterial amylases into maltose, maltotriose, and low-molecular-weight dextrins (Mbrmann and Muhlemann, 1981). Starch hydrolysis on the teeth is very rapidly initiated, and entrapped particles of food can accumulate high levels of maltose and maltotriose, which are good substrates for bacterial acid production (Neff, 1967; Imfeld, 1983; Kashket et al., 1994, 1996). Maltose fermentation requires bacterial adaptation under certain conditions (Kashket et al., 1994). In humans, however, plaque bacteria appear to be adapted and can ferment this sugar without delay (Neff, 1967; Imfeld, 1983; Lingstrbm et al., 1993a)." "Clinical studies have shown that caries is associated with increases in the proportions of acidogenic and aciduric (acid-tolerating) bacteria, especially mutans streptococci (such as S. mutans and S. sobrinus) and lactobacilli, which are capable of demineralizing enamel [16, 17, 18, 19]. These bacteria can rapidly metabolize dietary sugars to acid, creating locally a low pH. These organisms grow and metabolize optimally at low pH. Under such conditions they become more competitive, whereas most species associated with enamel health are sensitive to acidic environmental conditions. However, although mutans streptococci are strongly implicated with caries, the association is not unique; caries can occur in the apparent absence of these species, while mutans streptococci can persist without evidence of detectable demineralization [20, 13]. Indeed, in such circumstances, some acidogenic, non-mutans streptococci are implicated with disease [18, 21, 22]. Detailed studies of the glycolytic activity of a large number of oral streptococci have shown that some strains of non-mutans streptococci(e.g. S. mitis biovar 1 and S. oralis) can still metabolize sugars to acid at a moderately low environmental pH at rates comparable to those achieved by mutans streptococci. "Caries is a result of changes in the environment due to acid production from the fermentation of dietary carbohydrates, which selects for acidogenic and acid-tolerating species such as mutans streptococci and lactobacilli." "Caries is caused by the dissolution of the teeth by acid produced by the metabolism of dietary carbohydrates by oral bacteria. The 2 primary bacteria involved in caries formation are mutans streptococci and lactobacilli. "The caries process can be described as loss of mineral (demineralization) when the pH of plaque drops below the critical pH value of 5.5; the critical value for enamel dissolution is 5–6, and an average pH of 5.5 (8, 9) is the generally accepted value. Redisposition of mineral (remineralization) occurs when the pH of plaque rises." "The longer plaque and tartar are on teeth, the more harmful they become. The bacteria cause inflammation of the gums that is called “gingivitis.” In gingivitis, the gums become red, swollen and can bleed easily. Gingivitis is a mild form of gum disease that can usually be reversed with daily brushing and flossing, and regular cleaning by a dentist or dental hygienist. This form of gum disease does not include any loss of bone and tissue that hold teeth in place. When gingivitis is not treated, it can advance to “periodontitis” (which means “inflammation around the tooth”). In periodontitis, gums pull away from the teeth and form spaces (called “pockets”) that become infected. The body’s immune system fights the bacteria as the plaque spreads and grows below the gum line. Bacterial toxins and the body’s natural response to infection start to break down the bone and connective tissue that hold teeth in place. If not treated, the bones, gums, and tissue that support the teeth are destroyed. The teeth may eventually become loose and have to be removed." I should acknowledge that a Cochrane review did find a very modest and possibly transient lowering of HbA1C after treatment for periodontitis. So the pamphlet is not completely baseless. However, it strikes me as a bit like the advice to lower salt for blood pressure, in that it has at best a very small effect and that effect is on one symptom, and that effect is negligible in comparison with the effect of lowering dietary carbohydrates. So not only is it unclear whether the effect is systemic — whether that would translate into an effect in further outcomes, but more importantly, it distracts from the fact that there is a way to effect HbA1c in a strong reliable way. This is why I see it as laughable and irresponsible. Simpson TC, Weldon JC, Worthington HV, Needleman I, Wild SH, Moles DR, Stevenson B, Furness S, Iheozor-Ejiofor Z.
Cochrane Database Syst Rev. 2015 Nov 6;11:CD004714. doi: 10.1002/14651858.CD004714.pub3. We searched for randomised controlled trials (RCTs) of people with type 1 or type 2 DM (T1DM/T2DM) with a diagnosis of periodontitis. Interventions included periodontal treatments such as mechanical debridement, surgical treatment and antimicrobial therapy. Two broad comparisons were proposed:1. periodontal therapy versus no active intervention/usual care;2. periodontal therapy versus alternative periodontal therapy. For this review update, at least two review authors independently examined the titles and abstracts retrieved by the search, selected the included trials, extracted data from included trials and assessed included trials for risk of bias.Our primary outcome was blood glucose levels measured as glycated (glycosylated) haemoglobin assay (HbA1c).Our secondary outcomes included adverse effects, periodontal indices (bleeding on probing (BOP), clinical attachment level (CAL), gingival index (GI), plaque index (PI) and probing pocket depth (PPD)), cost implications and diabetic complications. We included 35 studies (including seven from the previous version of the review), which included 2565 participants in total. All studies used a parallel RCT design, and 33 studies (94%) only targeted T2DM patients. There was variation between studies with regards to included age groups (ages 18 to 80), duration of follow-up (3 to 12 months), use of antidiabetic therapy, and included participants' baseline HbA1c levels (from 5.5% to 13.1%).We assessed 29 studies (83%) as being at high risk of bias, two studies (6%) as being at low risk of bias, and four studies (11%) as unclear. Thirty-four of the studies provided data suitable for analysis under one or both of the two comparisons.Comparison 1: low quality evidence from 14 studies (1499 participants) comparing periodontal therapy with no active intervention/usual care demonstrated that mean HbA1c was 0.29% lower (95% confidence interval (CI) 0.48% to 0.10% lower) 3 to 4 months post-treatment, and 0.02% lower after 6 months (five studies, 826 participants; 95% CI 0.20% lower to 0.16% higher).Comparison 2: 21 studies (920 participants) compared different periodontal therapies with each other. There was only very low quality evidence for the multiple head-to-head comparisons, the majority of which were unsuitable to be pooled, and provided no clear evidence of a benefit for one periodontal intervention over another. We were able to pool the specific comparison between scaling and root planing (SRP) plus antimicrobial versus SRP and there was no consistent evidence that the addition of antimicrobials to SRP was of any benefit to delivering SRP alone (mean HbA1c 0.00% lower: 12 studies, 450 participants; 95% CI 0.22% lower to 0.22% higher) at 3-4 months post-treatment, or after 6 months (mean HbA1c 0.04% lower: five studies, 206 patients; 95% CI 0.41% lower to 0.32% higher).Less than half of the studies measured adverse effects. The evidence was insufficient to conclude whether any of the treatments were associated with harm. No other patient-reported outcomes (e.g. quality of life) were measured by the included studies, and neither were cost implications or diabetic complications.Studies showed varying degrees of success with regards to achieving periodontal health, with some showing high levels of residual inflammation following treatment. Statistically significant improvements were shown for all periodontal indices (BOP, CAL, GI, PI and PPD) at 3-4 and 6 months in comparison 1; however, this was less clear for individual comparisons within the broad category of comparison 2. 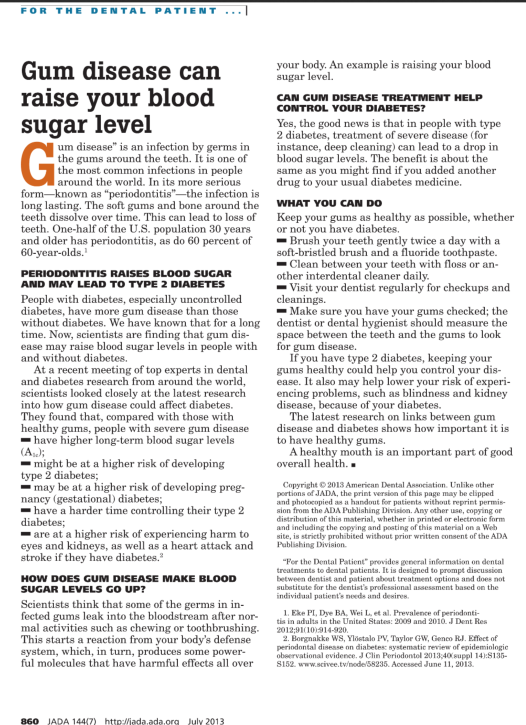 There is low quality evidence that the treatment of periodontal disease by SRP does improve glycaemic control in people with diabetes, with a mean percentage reduction in HbA1c of 0.29% at 3-4 months; however, there is insufficient evidence to demonstrate that this is maintained after 4 months.There was no evidence to support that one periodontal therapy was more effective than another in improving glycaemic control in people with diabetes mellitus.In clinical practice, ongoing professional periodontal treatment will be required to maintain clinical improvements beyond 6 months. Further research is required to determine whether adjunctive drug therapies should be used with periodontal treatment. Future RCTs should evaluate this, provide longer follow-up periods, and consider the inclusion of a third 'no treatment' control arm.Larger, well conducted and clearly reported studies are needed in order to understand the potential of periodontal treatment to improve glycaemic control among people with diabetes mellitus. In addition, it will be important in future studies that the intervention is effective in reducing periodontal inflammation and maintaining it at lowered levels throughout the period of observation."